I won't be doing a Theresa May, you can be sure of that. Those were the words of Leo Varadkar in an interview with the Sunday Independent shortly after he was elected as the country's youngest ever leader. Now we stand on the verge of a snap election, albeit for very different reasons than May's. For a start, Varadkar has no hope of achieving an overall majority - but he is prepared to go to the country sooner rather than later. Across the benches, Fianna Fail has been patiently waiting for its moment to collapse the minority government. All of this was inevitable. What nobody predicted was that it would do it in the dark days before Christmas. The reality is that if Fianna Fail believes the treatment of whistleblower Maurice McCabe is reason to call an election, then it missed its moment to pull the plug nine months ago. Cast your minds back to that Sunday afternoon in February when an already lame Enda Kenny went on RTE Radio to talk about a conversation he had with Independent minister Katherine Zappone. You might not have heard the interview live but you definitely heard it replayed in the following days. Kenny described how the minister told him she planned to meet Maurice McCabe in relation to a Tusla file which contained outrageously wrong allegations about him. "Minister Zappone, who is doing a very good job, was meeting Maurice McCabe in a private capacity, I simply said 'do make sure you have a very thorough account of it'," he said with great clarity. A similar 'who knew what and when' debate quickly followed, with the Children's Minister flying back from the United States to newspaper headlines predicting her immediate demise. Instead a jet-lagged Zappone marched onto the Leinster House plinth to say no such conversation took place and all hell broke loose. "I might say mea culpa, because I am guilty here of not giving accurate information," Kenny eventually admitted. There followed Dail questions, talk of the Government collapsing and a dispute between Fianna Fail's Jim O'Callaghan and Justice Minister Frances Fitzgerald over a conversation they had in the Dail bar. Eventually though Fianna Fail pulled back from the brink, with O'Callaghan saying it would be "crazy" to bring down the Government at that moment in time. The Charleton Tribunal was established and 'new politics' continued to provide cover for all sides. Many in Fianna Fail believe that was a missed opportunity. The reasoning for bringing the Government down was more solid than it is now. Mr Kenny had lied about or at very best imagined a conversation on a very serious issue that never took place. Had the curtain come down then, Fine Gael would have spent the first week of a campaign finding his replacement. Micheal Martin would have had a clear run at the country but in the words of one frontbench TD, he "bottled it". No doubt the backlash he faced from the 'locker room' in the weeks after that controversy was playing heavily on Mr Martin's mind as he plotted a way to bring down Ms Fitzgerald. The assumption was she would go quietly like Alan Shatter. There might be a blowback later - but like in the case of Shatter, once you're gone, you're gone. However, the political plates have shifted dramatically since February. Enda Kenny and Frances Fitzgerald are long-time political allies. He appointed her as Fine Gael's leader in the Seanad after she failed to win a Dail seat in 2007. And she stood loyally by him during the heave in 2010. Yet if Kenny were Taoiseach today, Fitzgerald would not be Tanaiste. He would have pushed her under a bus, a Luas, a tractor or whatever it took rather than risk being contaminated by this controversy. The Tanaiste owes a lot to Kenny and would have fallen on her sword at his request. But Varadkar isn't going to ask that of "someone who helped me to believe that I could serve my country as a politician". Speaking yesterday, he described Fitzgerald as "someone who helped me to believe that I could be a leader, that I should be judged by my ability and my politics and not on my sexuality or the colour of my skin". So the stalemate continues. Martin gave the Government a free pass in February and politically can't do so again. Varadkar won't sacrifice his deputy leader for political expediency. As a result, an election is inevitable. The Confidence and Supply is dead. If we're not voting in the days before Christmas, then we will be in January. Which brings me back to the UK comparison. When the Taoiseach said he wouldn't be "doing a Theresa May", he meant it. He hasn't shown any sign of calling a snap election since taking office. Yet Fianna Fail has now offered up one and sources in Fine Gael say Varadkar is happy to take it. But he still won't be doing a Theresa May and that's why a December election is the most likely outcome. May launched a seven-week snap election campaign that quickly ran out of steam. "Seven weeks was ridiculous. We'd be better to keep it short and sharp," said one minister who claimed to have been talking directly to Leo Varadkar about the issue. The logic is that postponing an election until late January leaves two months open for unexpected traumas. The list of potential hazards is lengthy: a big freeze, hospitals running out of trolleys, homeless people dying on the streets over Christmas. On the flip side, there are the Brexit negotiations. Leo Varadkar is due to travel to the EU Council meeting on December 14, just days before the likely polling date. All the signs are that the Taoiseach will have to use Ireland's veto to prevent a wibbly-wobbly wonder border designed by the UK Conservatives as an afterthought. On election day in February 2016, the Irish Independent ran a front-page headline saying 'Kenny backed by Cameron'. 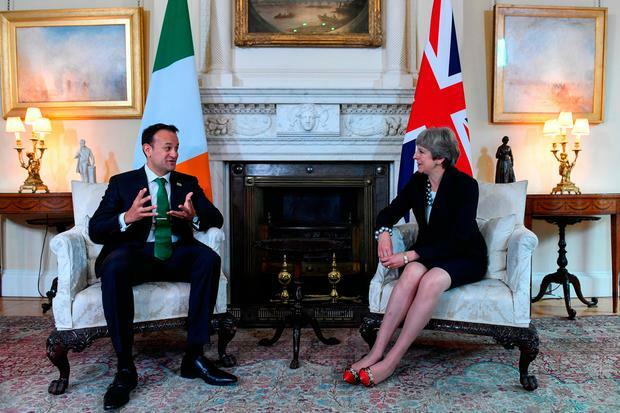 It came on the back of a pre-election letter sent from then UK prime minister David Cameron in which he thanked the then Taoiseach Enda Kenny for his help in the pre-Brexit referendum negotiations. In the current situation, Varadkar must see the opportunity for a headline about how he is standing up to Britain for all the people of this little island. A Fine Gael leader fighting with the UK Conservatives is likely to be prove a far bigger vote winner than one sending love letters across the Irish Sea. So while Fianna Fail might be blamed for causing the election, on some level Fine Gael wants it.